In June 2012 the Scottish Government published “A Right to Speak” (Scottish Government 2012) which included a four million pound fund to help improve services in Scotland for people who use Alternative and Augmentative Communication (AAC). At that time we were a small fledging social enterprise with a vision to improve the lives of people with communication difficulties in Scotland. We have been fortunate to be able to make our contribution to Right to Speak and as the initiative ends at the end of this month it is good to reflect on the work that we have contributed to over the past 3 years. At the beginning we were heavily involved in the research aspect of the project, carrying out a critical appraisal of outcomes for people working in AAC. This led onto a second project to evaluate the validity and reliability of the Therapy Outcome Measure for AAC. We were pleased to be able to do this in conjunction with Prof Pam Enderby and a number of AAC professionals throughout Scotland. The Therapy Outcomes Measures, third edition has just been published which includes a section on AAC co-written with Joan and Sally. This should allow professionals to be much more specific in monitoring and measuring the impact of AAC intervention. A second piece of research we carried out was to explore what matters to AAC users in terms of service delivery. It was a great privilege to listen to the views of people who use AAC from all over Scotland and we were able to theme those views into 10 key quality indicators. This led on to one AAC partnership asking us to design a Talking Mat to enable AAC users to give feedback on their service. This was successful and NHS Education then asked us to roll that out across Scotland. 40 people have just attended 4 specialist seminars and received the resource. We believe that taking the time to listen to people and ask for feedback in a structured way is really important and so to continue to support that we are making the ‘Talking Mats AAC feedback’ script ,symbol set people and symbols set services available on the free stuff section of our web site. We were fortunate to win the tender to design an online learning resource for staff working with children and young people. It is designed to help professionals take a holistic and values based approach to working with young people to support their health and wellbeing. The resource contains a collection of film clips that depict three different environments in which young people use AAC: a mainstream primary school, a mainstream high school and a specialist school. 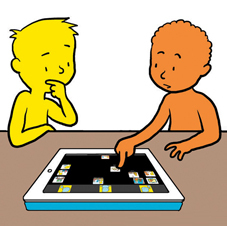 It provides a Learner’s Workbook which shows the learner how to use the film clips to improve the way they promote inclusion and participation for young AAC users. It will support equip practitioners to shift from a model of working where interventions are done to the child/young person to a process where work is done with children and families to focus on what is important to them. It is about to launch on the NHS Education web site. It’s been a busy 3 years and it’s both exciting and gratifying that so many more people know about AAC and know that it is not a responsibility that rests with just one profession . The complexity of communication means we all have to play our part but we all recognise there is still much to do to really ensure people who use AAC are fully included in society. As a social enterprise we would no longer describe ourselves as ‘fledgling’ –we have well and truly hatched ! We are grateful that during our critical start-up period winning tenders for right to speak also helped us on our journey. We will continue to fulfil our vision of supporting people with communication difficulties and we recognise right to speak has given us a legacy of research and resources that will help us do that. This entry was posted in AAC, Blog, Communication difficulties and tagged AAC, Communication difficulties on March 25, 2015 by Lois Cameron. We are delighted that Sally, our Senior Associate, has been offered the post of Head of Department for Palliative Care Education, Research and Practice Development at Strathcarron Hospice. We swing from being magnanimous to distraught!! – but it’s a wonderful opportunity for her and she will be a fantastic asset to their department. We will continue to work closely with her but we will really miss her as she has a key role in our team. However, it also means that we are looking for another person to join us. See attached job description. We are looking for a full time person to join the Talking Mats Team and depending on experience, level of skills and business acumen, the post will be either ‘Talking Mats Associate’ or Talking Mats Senior Associate. The closing date for applications is Thursday 26th March and the date for interviews is Thursday 2nd April. This entry was posted in Blog and tagged Talking Mats on March 5, 2015 by Joan Murphy.